You name it, we print it. Rush flyer printing, brochures, catalogs, business cards – whatever your needs, Printing Brooklyn has you covered. 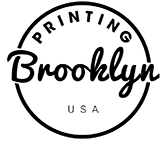 Printing Brooklyn is your expert printing store in New York for everything from brochures to business cards, luxury printing as well as large format outdoor printing. We have all your needs covered. When you need your prints in a hurry, we specialize in same day rush printing in New York City and we offer a huge range of environmentally-friendly printing products and materials including recycled business cards, stationery, brochures as well as use soy inks. Our professional printing team is here to take your printing project to the next level; with state-of-the-art printing equipment allowing you the convenience and flexibility you need – whatever the job requirements. We are a proud local Brooklyn business that delivers high quality, fast turnaround printing, for individuals right through to corporate clients. We offer both offset and digital printing, as well as timeless and luxurious letterpress printing and special effects. Come and see us in Brooklyn today and discover how we can supercharge your next printing project! Pickup in our convenient Brooklyn location or take advantage of our FREE NATIONWIDE shipping delivered direct to you with UPS couriers.